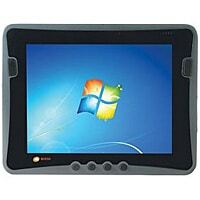 The DLI 9000 from Data Ltd Inc is a rugged tablet PC comes with an optional mobile payment module that can be used to process NFC transactions. The tablet, announced in May 2012, is based on standard PC architecture and can run Windows 7 or Android 4. The device also features multiple radios including WiFi, cellular and Bluetooth, along with GPS. The optional rear-mounted five-in-one payment module includes a magstripe and EMV chip reader, a PCI-compliant PIN pad, a contactless payment interface and a barcode reader, allowing full portable payment processing. The impact resistant IP54-rated device weighs less than two pounds, boasts a 9.7-inch LCD touchscreen and also has an integrated TPM chipset.